It is a great pleasure to be back in Germany, this beautiful, dynamic and inspiring country. I made my first official visit to Germany as Chief Secretary for Administration of the Hong Kong SAR Government in May 2014, covering the two important cities of Frankfurt and Berlin. That trip left me deeply impressed by the country's all-round achievements in education, conservation, democratic institutions, technology, as well as art and culture. My stay in Frankfurt two years ago included a business luncheon jointly organised by our Berlin Economic and Trade Office and the Hong Kong Trade Development Council (HKTDC), supported by the German Asia-Pacific Business Association during which I made a presentation on Hong Kong's competitive edge as Asia's World City. I am honoured to have the opportunity to speak to our German friends again at this "Think Asia, Think Hong Kong" dinner hosted by the HKTDC in Frankfurt. It's just a pity that my stay in Frankfurt on this occasion, scheduled between a HKTDC dinner in London last night and a HKTDC seminar in Düsseldorf tomorrow, is far too short - less than 18 hours! But Frankfurt is no unfamiliar place to me. I was here last August whilst on a short summer holiday. In fact, as I have told the guests at last year's German National Day reception in Hong Kong, Germany is the overseas country that I have travelled most extensively, whether for leisure or business. These repeated trips have taken me to the political and business centres of Berlin, Frankfurt and Munich; to the university towns of Heidelberg and Tubingen; to the industrial powerbases of Hanover and Stuttgart; to the famous Black Forest towns of Baden-Baden and Hinterzarten; to the beautiful lake area at Titisee; the port of Hamburg on a cruise itinerary and the world’s oldest social housing project in the city of Augsburg. For those who enjoy outlet shopping like me, the Outlet City Metzingen near Stuttgart is highly recommended. I come to know more about the German people through these visits. They are disciplined, business-like and no-nonsense, yet they are friendly, helpful and warm. On a national scale, their attitude towards the War, their efforts over the Re-unification and their act on the large number of refugees who want to settle in Germany have won the admiration of many people. As the 26th Anniversary of the Day of German Unity is approaching, may I take this opportunity to send my warmest regards to the people of the Federal Republic of Germany. Now coming back to the purpose of this visit: I am here on a mission to promote Hong Kong's powerful package of advantages for businesses. And what we may offer beyond businesses. Before I do that, let me first thank the Hong Kong Trade Development Council and Vincent (Lo), its Chairman, for staging this high-profile "Think Asia, Think Hong Kong" event in Germany to strengthen links with one of our largest trading partners. Germany is Hong Kong's largest trading partner among the 28 European Union Member States. Last year, the bilateral trade between Hong Kong and Germany reached US$16 billion. Germany is one of Hong Kong's major sources of inward direct investment, valued at about US$4.7 billion in 2014. These are not the best figures we have ever had, but are certainly impressive given the fierce global economic challenges today. I believe we can boost our business ties and build new ways of working together, which is why we are staging "Think Asia, Think Hong Kong" in Germany. Hong Kong is an attractive gateway to China for German companies. Not only because of Hong Kong's deepening integration with our motherland's economic development, but also given Hong Kong's unique advantages as a highly autonomous Special Administrative Region, thriving under "One Country, Two Systems". Our strong tradition in the rule of law, low level of corruption, and a free and open economy are the core advantages and values of Hong Kong - much valued by overseas and Mainland businesses. In fact, China and Germany have established close bilateral relationship for many years. Next year will mark the 45th anniversary of the establishment of diplomatic relations between China and Germany. In respect of trade, China has been Germany's largest trading partner in Asia since 2002. In 2014, bilateral trade volume between China and Germany amounted to US$177 billion, and among which US$11.4 billion or about 7.3 per cent of total trade between Germany and the Mainland was routed through Hong Kong. In addition, German foreign direct investment (FDI) in China was worth more than US$45 billion while Chinese FDI in German was worth nearly US$1.6 billion. There are some 900 Chinese companies operating in Germany, and more than 5 000 German companies are active in China. If compare the two sets of figures that I have just mentioned, it appears that there is still very strong potential for more Chinese investment to look for business opportunities in Germany. 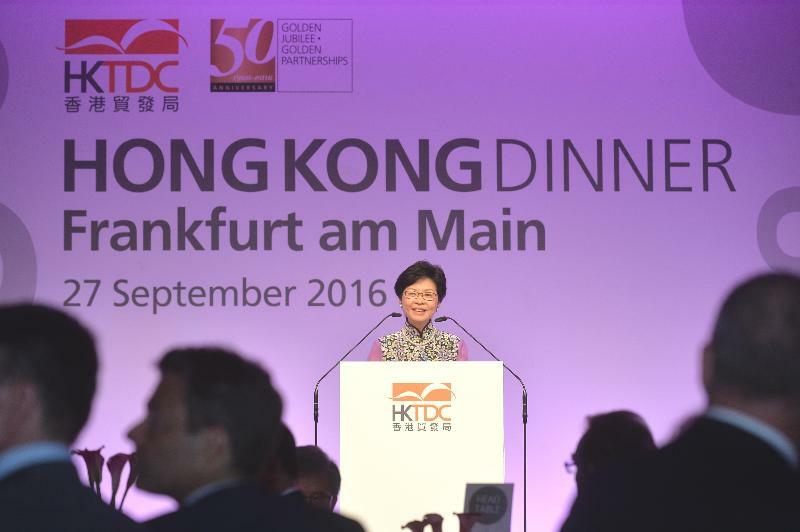 Hong Kong is well-placed to enable German businesses and investors to tap the rewards of the Mainland China and the Asian region. We consistently rank high in the world's leading surveys of best business cities, economic freedom, competitiveness, opportunity and ease of doing business. The US-based Heritage Foundation has ranked Hong Kong the world's freest economy for 22 consecutive years. We are also rated as the most competitive economy by the International Institute for Management Development in Switzerland. Hong Kong is geared to make it easy for business. We have a simple and low tax regime and a level playing field for all companies whether they are based in Germany or anywhere else. We were again voted "Best Business City in the World" in the 2015 annual readers' poll by Business Traveller Asia Pacific magazine. Our excellent business environment is also recognised by the World Bank, which ranks us the fifth easiest place to do business in the world according to their Doing Business 2016 Report. Hong Kong is also renowned for being one of the safest cities in the world to live and to work, with only 910 crimes per 100 000 population - a new low since 1972. Then there is our privileged and special relationship with China, the world's second largest economy. First, let me mention the special free trade pact between Hong Kong and Mainland China. Called the Mainland and Hong Kong Closer Economic Partnership Arrangement, or CEPA for short, it enables foreign companies based in Hong Kong to gain easy access to the Mainland market through various tariff-free privileges. That means German investors can set up a company in Hong Kong, partner with, invest in or even acquire service suppliers in Hong Kong to make use of CEPA opportunities to reap the rewards of opportunities in China. We have also built strong international trade and investment network and are expanding it through signing more bilateral agreements with our trading partners. Right now, we are negotiating a free trade agreement with the Association of Southeast Asian Nations which is expected to be concluded within this year. We have also signed 35 agreements on avoidance of double taxation with 11 more, including one with Germany in the process of negotiation. As for investment promotion and protection agreements (IPPA), 18 have been signed. The IPPA with Germany was signed in 1996. To facilitate the promotion of trade and investment opportunities with our trading partners, we have established 11 Economic and Trade Offices (ETO) overseas including the one in Berlin which was established in 2011. We are setting up the 12th ETO in Jakarta, Indonesia and another one, the 13th, in Seoul, South Korea. Additional liaison units will also be established in strategic locations in China. There are 340 German companies including over 200 regional headquarters and regional offices based in Hong Kong. They know well about our business-friendly environment in the form of low and simple taxes; a level playing field; the rule of law; free flow of capital, information and talent; world-class infrastructure; and unrivalled connectivity to China's, regional and global markets. Hong Kong is China's key financial centre and one of the world's leading financial capitals. According to the World Investment Report 2015 published by the United Nations Conference on Trade and Development, we are the world’s second largest recipient of FDI and second largest source of FDI. We also have the eighth largest stock market in the world in market capitalisation. Last year, we ranked first globally in equity funds raised through initial public offerings. And Hong Kong continues to play a key role in China's continuing financial and economic liberalisation. We are the world’s largest offshore Renminbi (RMB) hub, processing over 70 per cent of RMB offshore payments. "Dim sum" bonds worth over RMB670 billion have been issued and trade settlement totalling RMB6.8 trillion has been processed through banks so far. The RMB will be included in the International Monetary Fund's special drawing rights basket of currencies in less than a week’s time, further expanding its global acceptance and use. Frankfurt has become one of the offshore RMB clearing locations since November 2014 to manage accounts denominated in Chinese currency for German and European banks and business enterprises. There is much room for Hong Kong and Frankfurt to foster collaboration in the pursuit of RMB internationalisation. Our location also gives us a natural advantage. Situated in the heart of Asia and at the southern gateway to Mainland China, Hong Kong is the "super-connector" between the Mainland and the rest of the world, thanks to our world-class services and strong logistical advantages. Our container port, which is among the busiest in the world, is serviced by more than 800 maritime-related companies. An important new rail connection with China is also moving full steam ahead. We expect the Hong Kong section of the Guangzhou-Shenzhen-Hong Kong Express Rail Link to be up and running in a couple of years' time. It will enhance Hong Kong's connections with key Pearl River Delta cities and also connect directly with China's national high-speed rail network. The Hong Kong International Airport has been the busiest cargo airport in the world for the past six years and is the world's eighth busiest passenger airport. Half the world's population is no more than five hours' flying time from Hong Kong, while all of Asia's major markets are less than four hours' flight away. Our airport is serviced by more than 100 airlines including the Lufthansa Airlines, operating over 1 100 flights a day, linking Hong Kong to about 190 destinations worldwide including Frankfurt, Munich and Düsseldorf and some 50 cities in China. To ensure that Hong Kong remains a regional aviation hub, the Airport Authority is building the third runway. Hong Kong is also emerging as an innovation and technology hub. Last year, we set up our Innovation and Technology Bureau to drive our ambitious technology agenda. Earlier this year, we launched a variety of innovation and technology policies and initiatives, including a US$560 million expansion of the Hong Kong Science Park, home to some 600 technology start-ups and companies. The focus of Science Park is mainly on robotics, smart cities, the Internet of Things and healthy ageing which are areas of special interest for Hong Kong. At last count, Hong Kong was home to more than 1 600 start-ups, representing an increase of some 50 per cent over the past two years. And we are working to build on those numbers. Among other things, we are establishing a US$260 million Innovation and Technology Venture Fund, partnering with private venture-capital funds to help finance promising local technology start-ups. We are also putting more resources into our world-class universities and R&D institutions, to help boost their mid-stream applied research in key areas of technology. We are liaising with top research and development institutions from all over the world, promoting Hong Kong as their gateway to Asia and, in particular, Mainland China. The response has been encouraging. A few months ago, the Massachusetts Institute of Technology opened its MIT Innovation Node in Hong Kong. The centre was set up to connect MIT's celebrated technology researchers, academics and students with opportunities available only in Hong Kong and, through Hong Kong, in the neighbouring Pearl River Delta. Sweden's Karolinska Institute, one of the world's leading medical universities, will soon open its first overseas research centre - at the Hong Kong Science Park: the Ming Wai Lau Center for Reparative Medicine will target such areas as genome editing, biomedical engineering and 3D tissue imaging. We are also moving ahead with financial technology (Fintech), which makes sense, given our international financial services prowess. A dedicated team, under Invest Hong Kong, will help start-ups, investors and research and development institutions to set up in our city. Alongside our local innovators, about 50 of the top 100 Fintech companies in the world operate out of Hong Kong. But Hong Kong works hard and plays hard. And we have much to offer in the form of entertainment, culture, sports and leisure - and culinary delights. Hong Kong Disneyland debuts its Iron Man theme area later this year. A new hotel, featuring an exploration theme, is slated to open there next year. Ocean Park, our other world-class theme park, opens its first hotel in the coming year, along with a giant water park in 2018. Meanwhile, we are taking big strides to establish Hong Kong as a major cultural hub. The West Kowloon Cultural District, extending across 40 hectares of parkland overlooking our famous cityscape, is now rapidly taking shape. We opened the first permanent facility, the M+ Pavilion, in July this year, setting a milestone in this long-term strategic investment. The opening of a host of other performance venues and a contemporary arts museum called M+ will follow. Together with major events like Art Basel, growing number of art galleries and successful art auctions, Hong Kong's status as a premier cultural hub is reinforced. And Hong Kong, of course, has a well-deserved reputation as a culinary paradise. The 2016 edition of the Michelin Guide Hong Kong and Macao features more than 60 restaurants, including many inexpensive restaurants and street stalls offering local delights, making Hong Kong's Michelin restaurants some of the most affordable in the world. We leverage these strengths to enhance continuous economic growth and our role in connecting China and Asia with the rest of the world, making us a perfect gateway for overseas corporations to access the thriving Asian and Mainland China markets. Furthermore, we are also gearing up to capitalise on our country's Belt and Road initiative. Inspired by two legendary economic corridors of ancient times, namely the Silk Road Economic Belt and the 21st Century Maritime Silk Road, this visionary initiative announced by President Xi Jinping aims to enhance policy co-ordination, connectivity, trade, financial integration, and people-to-people links amongst over 60 nations across Asia, the Middle East and Europe. 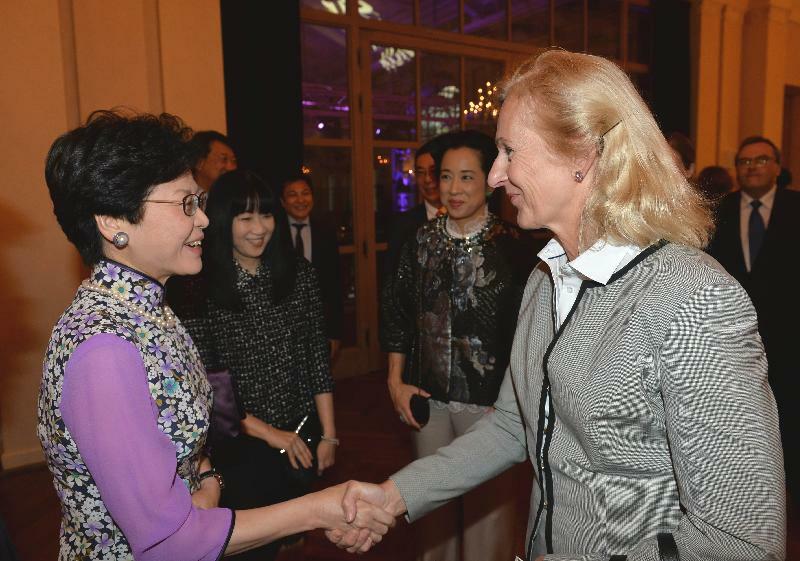 Thanks to our unparalleled advantages for business and the unique role as the gateway to China and the rest of the world, Hong Kong is powerfully positioned to make a major contribution to this important initiative. Zhang Dejiang, Chairman of the Standing Committee of the National People's Congress, made that clear at the inaugural Belt and Road Summit held in Hong Kong in May 2016. We have asset-management professionals, along with the capital markets and financial products to serve as the financial engine for the Belt and Road projects. We also have abundant expertise to lead the way, including project negotiation and management, accounting, architecture, engineering and many other specialised areas, including international law and professional arbitration services. Infrastructure development is at the heart of the Belt and Road initiative. Germany, as a member of the Asian Infrastructure Investment Bank which was set up to help finance the Belt and Road projects in Asia and beyond, as well as a global leader in infrastructure has much to offer - and gain from - this brilliant, far-reaching initiative. So, Hong Kong's role as the "super-connector" between China and the rest of the world, including Germany, is bound to strengthen. In conclusion, let me extend an invitation to you to the 15th Asia-Pacific Conference of German Business, which will take place in Hong Kong for the first time this November. The Conference, which will bring together high-profile Asian and German business leaders and government officials, is the largest event of its kind in the region. To underline the importance we attach to this Conference, the HKSAR Government will host a Government Evening Reception for delegates in the beautiful premises of a restored heritage site. So I look forward to seeing you all there. Once again, my thanks to the Hong Kong Trade Development Council for staging another memorable Hong Kong event in Germany today. Let me also take this opportunity to introduce you to our colleagues who look after our business partnership in Europe - Ms Shirley Lam who is Special Representative for Hong Kong Economic and Trade Affairs to the European Union stationing in Brussels and Ms Betty Ho, Director of the Berlin Economic and Trade Office of Hong Kong. Please feel free to contact them on any good things that you may have on Hong Kong.